It seems like Christmas is just around the corner, especially since everyone seemed to have their decorations up by the 1st December and had their gifts bought months in advance. But don’t worry if you’re not quite there with all the presents and food planning yet (we’re not! ), as you’re not too late for Christmas with Thomas the Baker just yet! Are you planning a last minute Christmas party for your friends and family but don’t want the hassle of catering it all by yourself? We can help! Our fantastic range of Party Platters will see you through every Christmas and New Year celebration, plus we’ve got a handy discount code which will get you 5% off ALL of our platters! We kept this a secret in our newsletter for a few weeks, but if you’ve missed out on that, tap in the code XmasPlatter5 during the checkout process for 5% OFF your total order. The discount is available to online customers and is not available when purchasing in store. If you’re wondering how you can keep up with any discounts, offers and deals available to our newsletter subscribers, make sure to fill in your email address at the bottom of this page (or any page on the site!) and we’ll email you as soon as we have a new one! Still thinking about Christmas presents? Want a last minute gift for a foodie? It’s not too late for that either with our Christmas Hamper range, packed full of goodies not only made in our craft bakery such as our Award Winning Sweet Mince Pies, traditional luxury Stollen slices and hand decorated Gingerbread Men, but complemented with gifts from other local Yorkshire suppliers, such as the Helmsley Brewing Company, Yorkshire Tea and our own brand of Strawberry & Champagne Preserve. 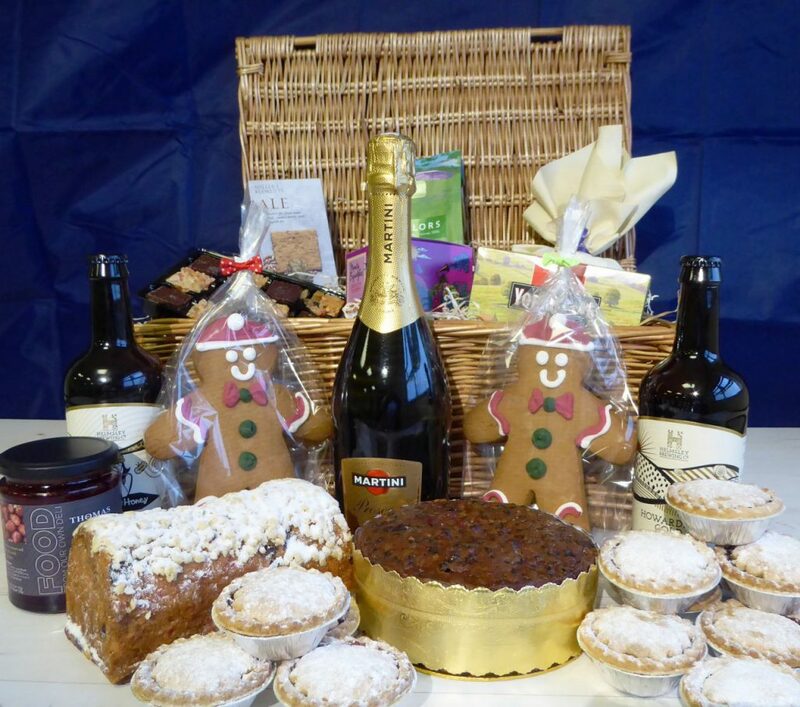 The hampers range from the small Yorkshire Festive Fayre at £32, the Tipsy Truckle Christmas Hamper at £47.50 to the Bumper Christmas Yorkshire Selection at £75. Can we also tempt you with our delicious range of handmade freshly baked pies? Made using only prime local meat and traditional hot water crust pastry all combined to make even Archimedes re-think the definition of good Pi! All of our perfect pies are available to buy or order directly from any one of our shops until the 19th December, so get your hands on them quickly! Traditional family pie made using fresh pork shoulder and local free range eggs. Entertaining a hungry family, there’s enough here for at least 10 generous portions. After months of deliberation over recipe formulations and much arduous tasting, Valerie Thomas, the co-founder of our company described this as the best pie she has ever eaten! We hope you will agree that this gently seasoned delicacy, packed with local pork and fresh English chicken, layered with cranberries is a sublime pie, and worthy of her praise. Made using the same award winning pork recipe as our traditional pies, these have the addition of our own recipe pork stuffing topping to perfectly compliment the taste. What other choices could you possibly want? 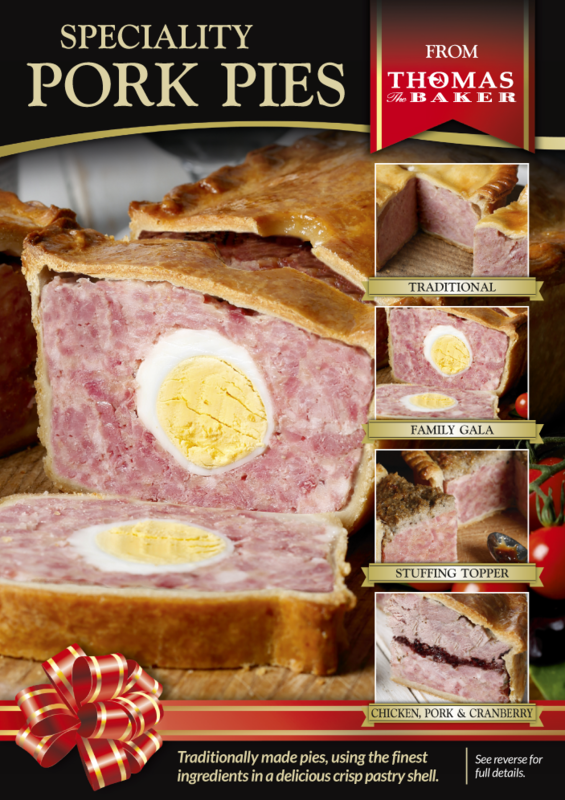 These award winning Pork Pies are a firm favourite , and will leave your guests asking for more. Freshly baked the same day in readiness for your collection, these award winning pies won’t hang around long on the Christmas table.